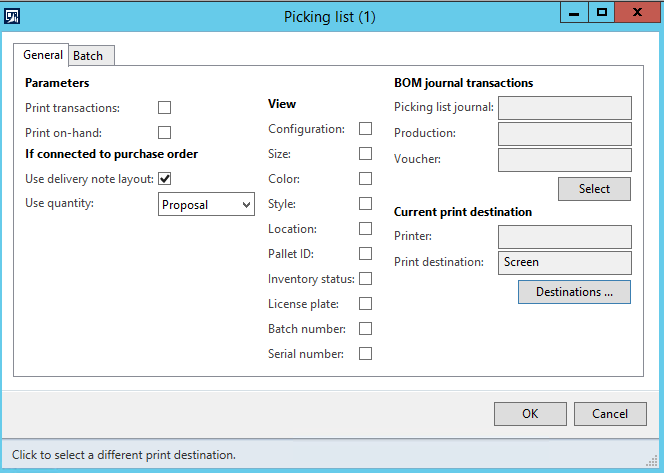 How to get the Production Picking list to Use the delivery note layout with Batch orders in Process Industries and Production orders. If you are creating a Production order with an outsourced purchase order for a service item and want to see the purchase order and delivery date. The ‘Use the delivery note’ is a nice option to use when starting the production order and printing the Production Picking list. Following, I will highlight the main steps needed to view the vendor delivery note information on the Picking List. 1. 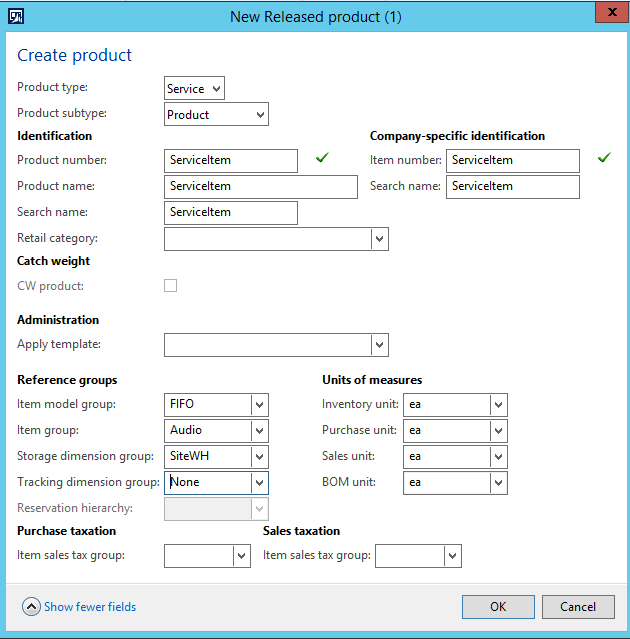 You will need to create a released product with a Product type of ‘Service’. 2. You will need to make sure that you have the Approved vendor setup completed for the service item. 3. You will need to create a Route for the finished good item. When creating the route make sure to use at least two Oper. No. sequences. You will need one for the regular inventory components and a second sequence for the outsourced Service item. 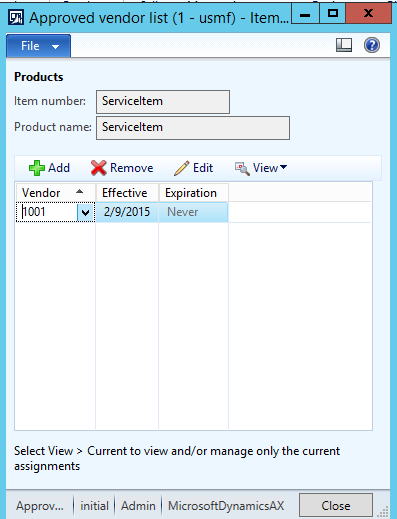 If you have multiple service items with different vendors, a separate Oper. No. sequence should be used for each service item. On the service Oper. No. 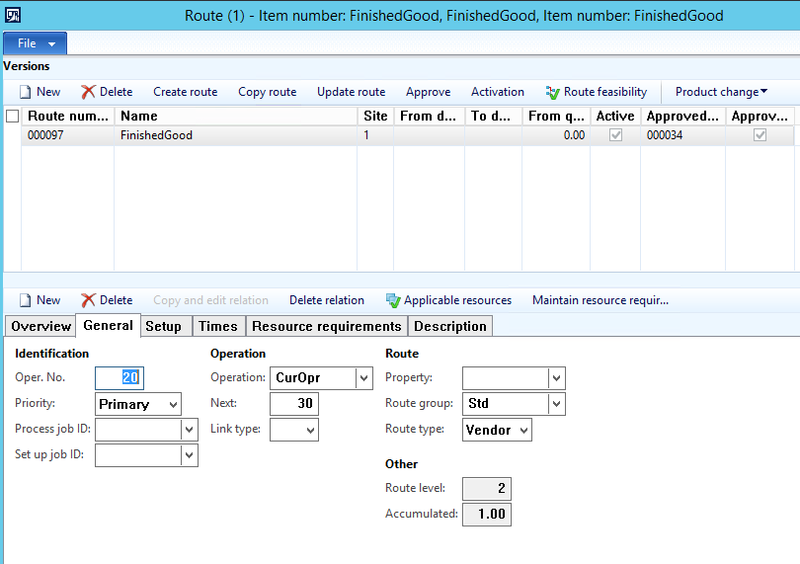 sequence click the General tab then select a Route type of Vendor. 4. You will need to create a Bill of Materials (BOM) for the finished good item. 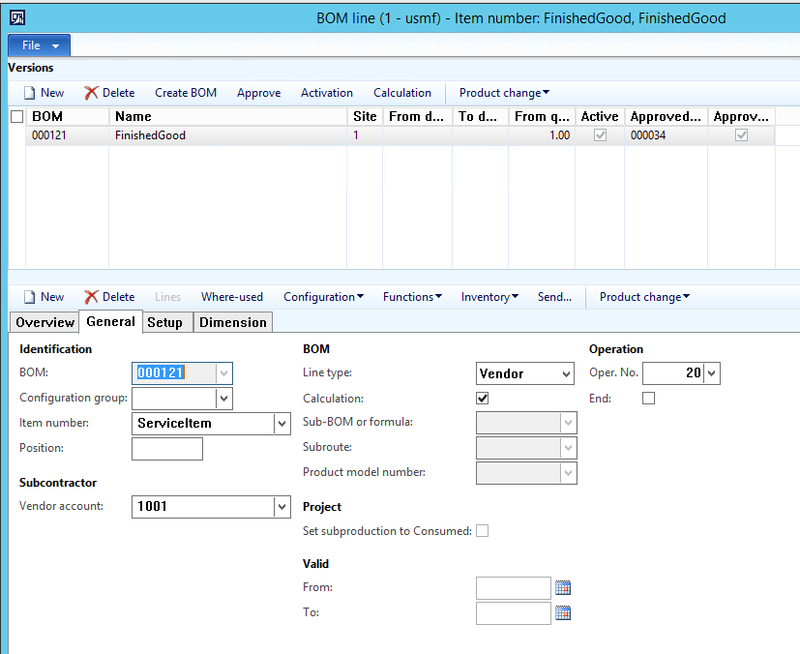 When you create the BOM for the finished good add the Service item to the BOM. Click the General tab and under Subcontractor add a Vendor account, and under BOM Line Type select Vendor. You will also need to match the Oper. No. to the route service sequence Oper.No. 20. 5. Next you will create the production order for finished good. 6. After the production order has been created, it should then be estimated. Click on Production order that was created, under process click Estimate, click Ok button. 7. Once it has been estimated, then you would start the production order. 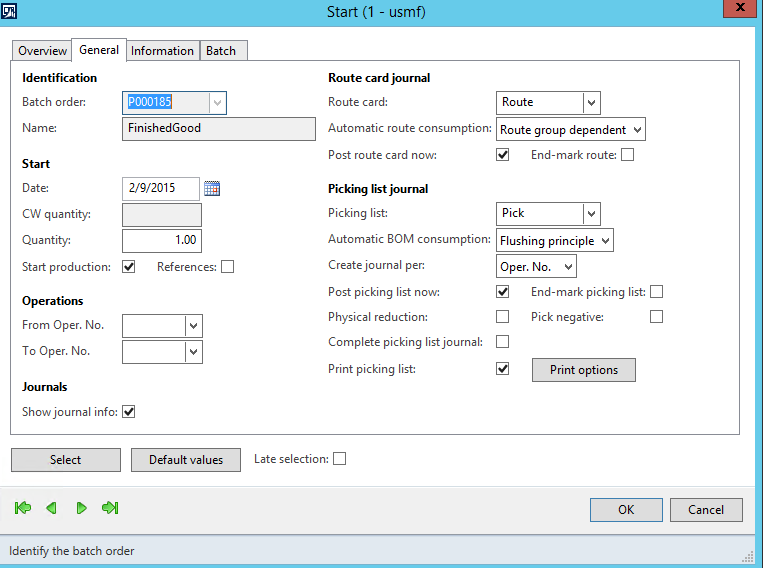 When starting the production order, click the General Tab and under Picking list journal and make sure that ‘Oper. No.’ is selected for the Create journal per option. Mark the Print picking list option. Then click the Print options button. 8. Mark the ‘Use delivery note layout’ option. Click the OK button in the Picking list form. Then click the OK button in the Start form. 9. Review the component item Picking list report and then close the report. 10. The next report should then be the Service item Picking List with Vendor delivery note. 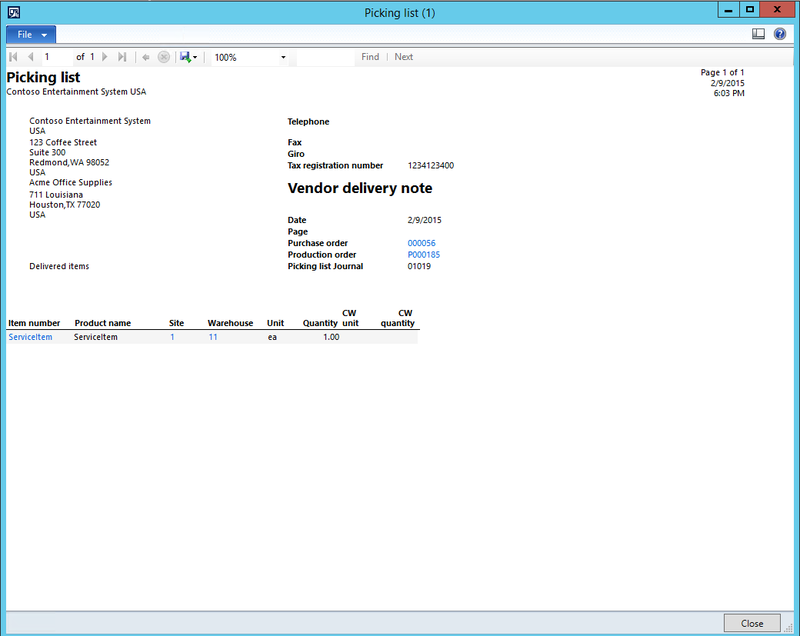 The vendor delivery note can be a very useful tool for the shipping\receiving department to plan for incoming service items and expedite them if needed. Note: If the above steps do not produce the Vendor delivery note there are a few hotfixes depending on your version and build that will help correct the issue. If you do a search with $\Classes\ ProdPicklistController you may find some that can potentially help.